We are running the tour event at the River Washburn on Sunday 9th September. 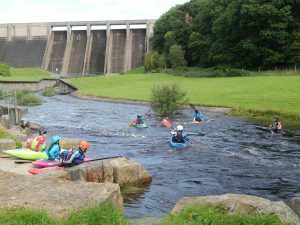 The Washburn is a dam controlled grade 3 river near Harrogate that releases on a number of occasions a year for canoeing, and we are running this event (water release to be confirmed). Help is needed throughout the day between 8:30am and 5pm. Ideally we want enough helpers to allow everyone to do just a couple of hours and enjoy the paddling the rest of the time. 4 or 5 people to be there at 8:30 to set up a gazeboo and kitchen. 4 or 5 people to be there at the end to pack everything away and clear up. Someone to take the Topo Duo and some kit, and someone to take it back to the club (could be the same or different people. To volunteer for any of these roles please add your name and choice of role on the list on the board in the club, or email/speak to Judith Forbes on volunteers@halifaxcanoe.org.uk. Experienced paddlers – you’ll be familiar with paddling on the Washburn or similar. Come along get together with other similar paddlers and enjoy the day. Please see the note below about help needed with taking people in the duo. 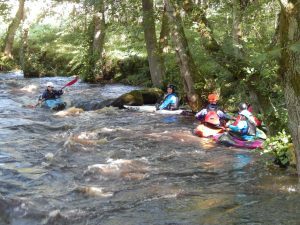 Intermediate white water paddlers – you’ll be used to paddling and hitting eddies at the club and paddled other with water rivers. 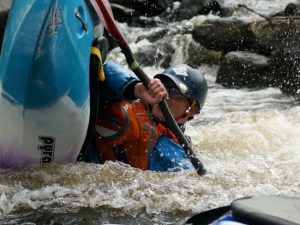 Our coaches will work with you to introduce you to the Washburn and develop your skills for this level of river. Topo Duo rides – this is for those that aren’t ready to take on the fast flowing water of the Washburn on their own yet (i.e. on the current beginners courses). We want to offer you the chance to experience it in a two-seater Topo Duo with an experienced paddler in the back. You or your parents will need to help carry the boat back up to the top. 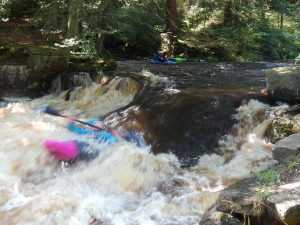 There is a charge of £10 per person (£6 juniors) to paddle for the day. Please email Les Ford (coaching@halifaxcanoe.org.uk) if you are coming to paddle so we have an idea of numbers in each group above (and for catering).